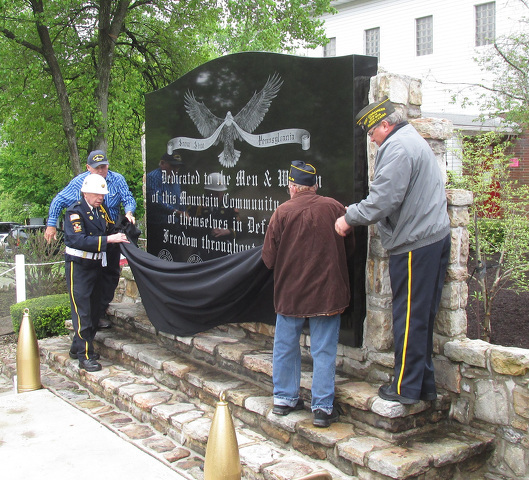 On Armed Forces Day, about 150 residents of Snow Shoe and the Mountaintop area gathered at the Snow Shoe Fire Company grounds to rededicate the town’s military veterans memorial plaque on its 75th anniversary. The May 19 ceremony followed the original 1943 service’s program. It opened with a welcome by Snow Shoe Mayor William Dudish and a blessing from Pastor Catherine Dittman. Following Dittman’s remarks, the monument was unveiled by several Mountaintop community members. A dark gray plaque, measuring approximately 6 feet by 9 feet, features an eagle with outstretched wings. The text reads, “Dedicated to the men and women of this mountain community who gave themselves in defense of freedom throughout the world,” with the logos of each of the five branches of the American military below. The monument originally was conceived by community and fire company members in 1942, at the height of World War II. By early 1943, the plans for the project were in full swing, with the hope that the plaque and a flagpole would be finished in time to be dedicated on Decoration Day of that year. On May 30, 1943, a flag-raising and dedication of the plaque and flagpole was held on the lawn of the Snow Shoe Fire Company. The original plaque featured an honor roll of veterans’ names, but by the 1970s, the plaque had deteriorated badly. The honor roll was removed and replaced by a white plywood façade. Other restorations were made for the U.S. Bicentennial celebration in 1976, followed by new paint and other touchups in 1984 and a new plywood front in 2014.The original flagpole was replaced in the early 2000s. Roger Elling, of the Centre County Veterans Affairs Department, delivered the address at the rededication ceremony. U.S. Rep. Glenn Thompson, R-Howard, and state Rep. Mike Hanna, D-Lock Haven, also addressed the crown, thanking those veterans from the Mountaintop area who gave their lives for freedom. The service concluded with a volley of rifle shots by members of Snow Shoe VFW Post 5644 and a benediction by Father Michael Wolfe. A community picnic followed at Snow Shoe Park.